This beautiful coin is the first release in the US Mint three-year program entitled “Preamble to the Declaration of Independence Platinum Proof Coin Series”. This series design was inspired by the handwritten words from the Declaration of Independence and includes “Life” in 2018, “Liberty” in 2019, and “Happiness” in 2020. 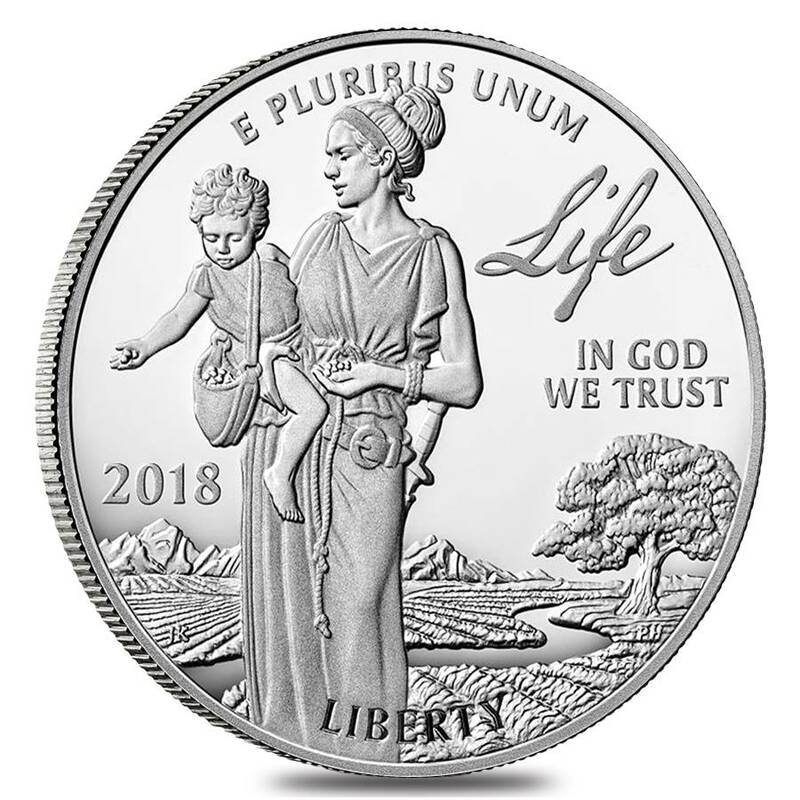 The 2018 design features “Life” theme and showcases Lady Liberty teaching a small child to sow seeds in a field. She carries a sword to symbolize the need to defend life. The furrowed earth represents the forethought and labor required to sustain life. The tree and stream represent nature, suggesting the need to be good stewards of an environment that sustains life. The reverse depicts an eagle in flight carrying an olive branch with its talons. This artwork will remain the common reverse design for the entire series (2018 - 2020). 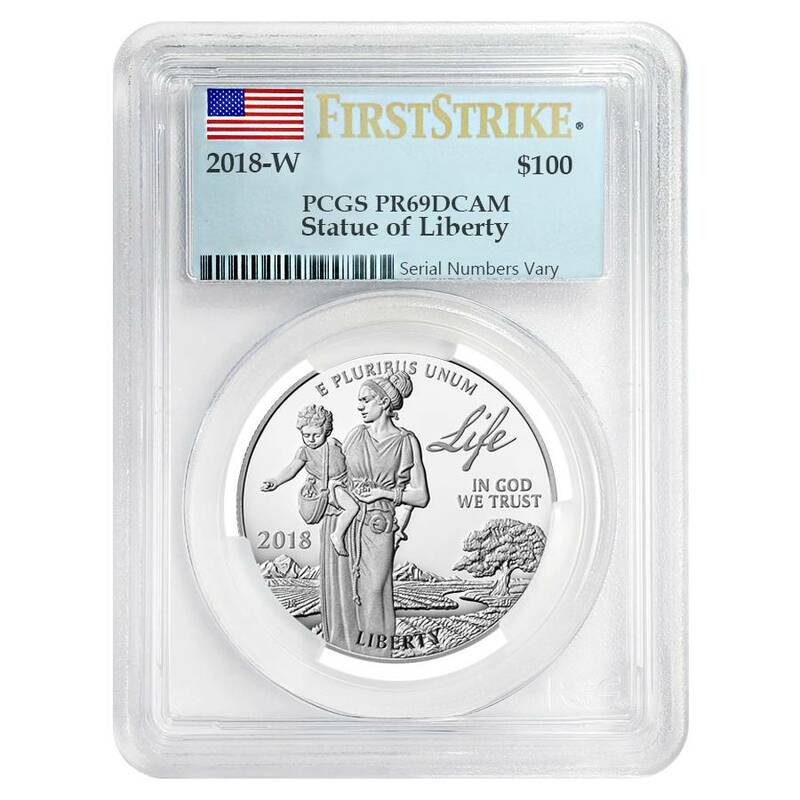 This beautiful coin was verified by the PCGS grading service within the first 30 days of Mint’s release as PF 69 First Strike - Virtually proof struck coin with minuscule imperfections visible upon close imperfection. Made from .9995 fine Platinum, with a weight of 1 oz. Produced by the US Mint. The first release in Preamble to the Declaration of Independence Platinum Proof Coin Series. Coin comes with a beautiful proof finish. Coin face value - $100 USD. PCGS PF 69 - Virtually proof struck coin with minuscule imperfections visible upon close imperfection. 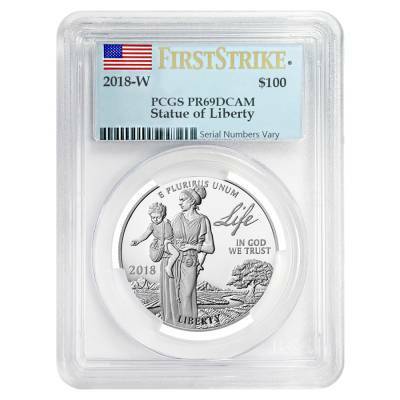 Coin comes in PCGS holder with First Strike label. 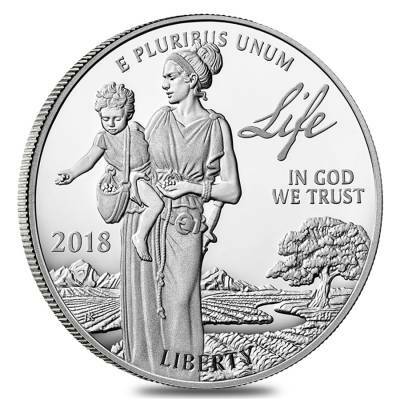 Obverse: Features Lady Liberty planting seeds in a field alongside a child. Inscriptions: “LIFE”, “IN GOD WE TRUST”, “E PLURIBUS UNUM”, “LIBERTY”, and the year of mintage. Designed by Justin Kunz. 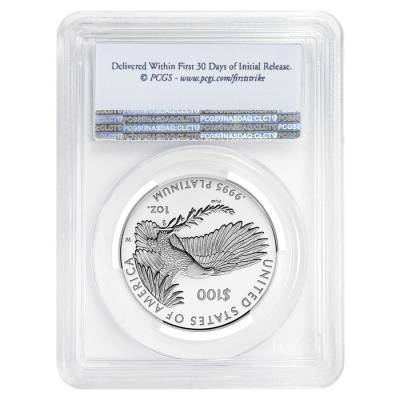 Reverse: Showcases an eagle in flight carrying an olive branch with its talons. 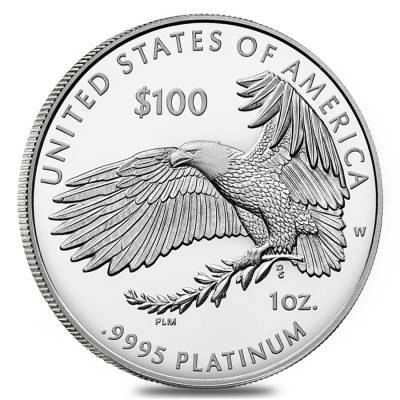 Inscriptions: “$100”, “1 oz”, “United States of America”, “.9995 Platinum”. The West Point “W” mintmark can be also seen on this side. Designed by Patricia Morris. Bullion Exchanges offers you an exceptional collection of spectacular bullion from renowned mints all over the world. Add this beautiful coin your portfolio today, and it will be carefully packaged and shipped to you in no time. For any questions, just call us at 800.852.6884, or send us a message, and we will happily assist you. I'm always on the fence when it comes to buying these new "series" but I really like the way this coin came out so I'm going to get the rest when they come out. I got this coins and I can't wait to complete my collection of this new series! For every $1 spend, you will earn 1 Bullionaire Buck which is equivalent to $0.001 off a future purchase. 1150 BB = $1.15.